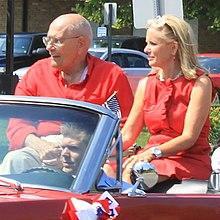 Jason Morgan remembers driving John Dingell around during long days when he was in Congress. Morgan says Dingell had a high level of commitment to the people he served and would often say he "worked for the people." Morgan recalls a delayed flight with the Congressman after a long day when Debbie Dingell insisted he stay with them that night. He said they were a highly connected couple adding he's never really seen anything like it. The Washtenaw County commissioner says it was seeing the Dingells' devotion to serving the public that made him decide to run for office himself.